I didn’t think I was going to get in the Titanfall beta. I used the signup link that everyone else used, and I didn’t get an invitation to the closed beta. Supposedly that would have been that, but just a day or two later, Respawn and EA opened the Titanfall beta up to everyone. In 3 hours, the beta link became available to me on Xbox One, and I happily downloaded 4.88 GB. 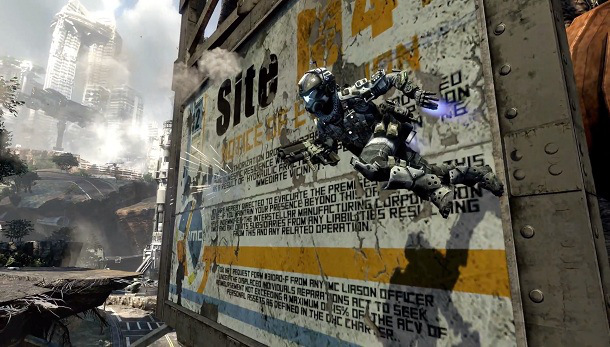 Titanfall has a decently long tutorial that quickly teaches you just how mobile you are. Jumping is quick and responsive like a platformer, and double-jumping is loose and free. Wall-running is easy to perform; so easy that you’ll find yourself doing it by accident. Beyond that, there isn’t really anything you haven’t seen before. At least, until you jump into a match. While Titanfall is ostensibly 6v6, you’ll find that there are enough bots of various levels of intelligence that you’ll be able to contribute to your team no matter how good you are. Bots are worth points, just like enemy players, so if you just want to hunt down bots, you can do so, and still contribute. The act of killing them is easy too, since the guns in Titanfall appear to have little or no recoil. Unlike my current mainstay, Battlefield 4, just put the reticle over the target and pull the trigger until the desired result is achieved. No need to burst your fire. Wall running looks cool, but I don’t see anyone using it. As far as the awesome mobility goes, I didn’t see too many people using it. People were double jumping only to get on top of buildings or other structures to set up sniping positions. Matches tend to be pretty short. Maybe 5-10 minutes. There’s a rhythm to them, especially since it tends to be the case that everyone unlocks their Titans at about the same time. Titan vs Titan combat is fun because you do feel like you’re in a mech for a variety of reasons. If you’re ever double-teamed, the friendly voice inside your rig tells you that you should probably get out of there. Titans have enough defensive options that it feels like you have to take turns. One person activates their magnetic bullet shield… oh, now it’s your turn to do so. Back and forth. Amazingly, having your Titan destroyed doesn’t feel too bad. You’ll get another in a few minutes, or less if you can do well on foot, but ejecting from your Titan flings you high into the air, usually allowing you to get to a great vantage point when you land, or even better, onto an enemy Titan. Rodeoing on an enemy Titan feels awesome and makes you feel powerful, as your bullets go right past the Titan’s shielding and onto their overall health. To summarize, there’s two points you should take away from this. Titanfall doesn’t look amazing. The textures feel a bit washed out, which could be related to the game rendering natively at 792p. There’s been an Xbox One firmware update that adjusts the internal upscaler, and most everyone agrees that games using the upscaler look much better. However, Titanfall is running the Source engine, the same one that powered Half-Life 2 ten years ago. The second thing is that it is very easy to feel like you are good at this game. It’s going to be pretty popular as a result, but part of me has a sinking feeling that I shouldn’t like this. It’s easy and it’s fun, what else matters, right? And yet, there’s something to be said for coming at a difficult challenge, learning it, overcoming it, and using that knowledge to put in a better gaming performance. At any rate, Titanfall is out on March 11 for Xbox One and PC, and March 25 for Xbox 360. It’s not very easy to actually be good. Killing AI is easy, killing pilots isn’t. In the beta people weren’t very used to the game up until the last day or so which is when the matches became challenging.